Map: Explorer 146 Dorking, Box Hill & Reigate. Total length: about 13.5 km (8½ miles). Start: Tattenham Corner station (shorter option: start from Tadworth station); finish: Kingswood station. 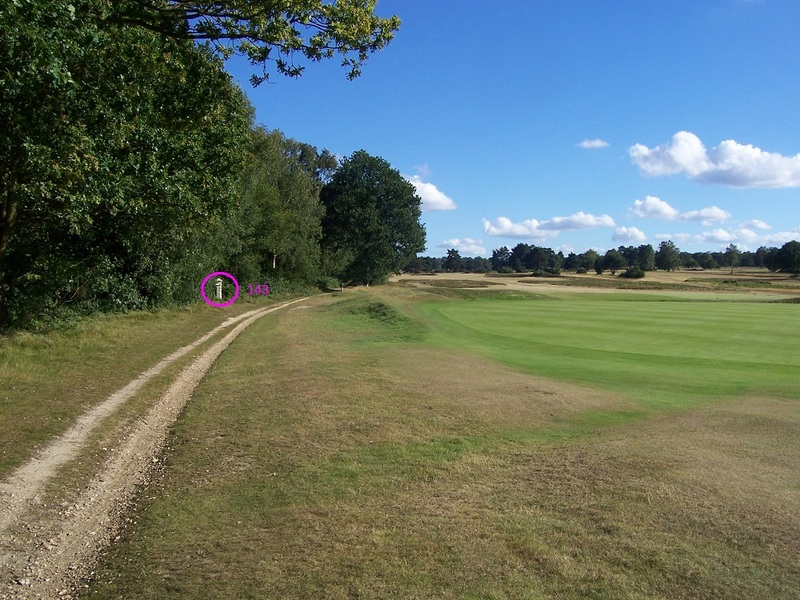 There is a particular concentration of posts in the area of Banstead and Walton heaths, there being nowhere else where so many posts can be seen in such a short distance. This walk passes 26 – more than an eighth of the surviving total – though all are Type 2 posts (no railway or canal marks are passed). The countryside is very attractive too: this walk is entirely on the North Downs, starting on the chalk of Epsom and Walton Downs, then crossing Banstead and Walton Heaths where the chalk is overlain by clay with flints, and reaching the scarp slope of the downs at Colley Hill. The walk follows the boundary of the former parish of Banstead along a salient projecting south from the main area of the parish, between the former parishes of Walton on the Hill to the west and Kingswood (once a detached part of the parish of Ewell) to the east. Parishes in the former Banstead Urban District were abolished by the Local Government Act 1972, so although the walk follows ancient boundaries these are not marked on current Ordnance Survey maps. The walk starts from Tattenham Corner station, which is the final station on a branch line from Purley. Trains run from London Bridge or Victoria depending on the time of the day. Although the branch is largely outside Greater London it is included in Transport for London Zone 6 and so travelcards valid for Zone 6, Freedom Passes, etc are valid to all the stations mentioned in this description. By car probably the best plan is to park at Kingswood station where the walk ends and take a train to the start. You can down load a pdf version of this description: Coal post walk on Banstead Heath (199 KB). Walk forward from the platforms at Tattenham Corner station with the station building on your left. Cross the road onto the grass ahead, turn left and walk to the top of the grassy mound. From here there is a fine view over Epsom racecourse, where the Derby and the Oaks are run. From the far left benches you can see the first post of the walk, Post 131, down the slope of the mound to your left. This post was moved when the station was reconstructed in the 1990s. Originally the low brick wall beyond the post was very much taller and the post stood by the road in front of it. From this vantage point you can also see Post 130: it is more or less straight ahead on the far side of the racecourse. Post 129 may also just be visible in front of the racecourse on the brow of the hill in the distance, but it is not easy to discern unless you know where it is. 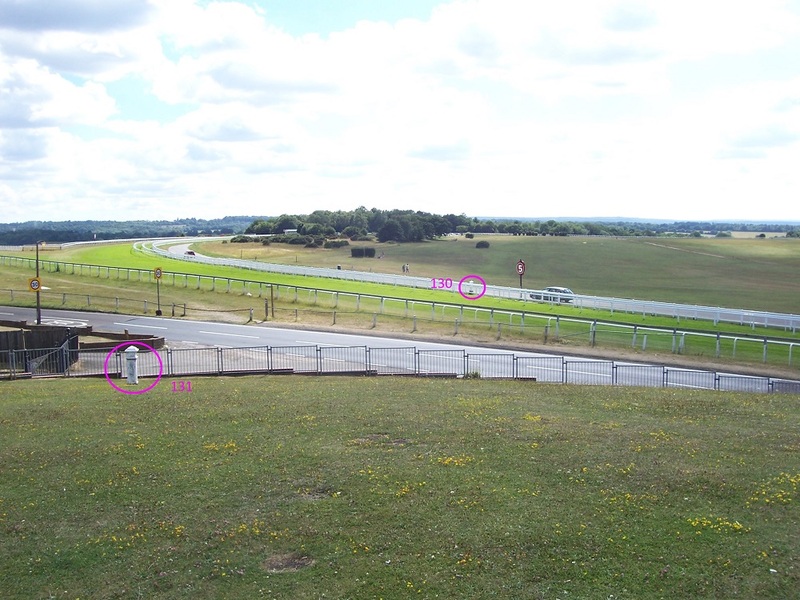 If you walk down to the railings ahead and look to the right you will be able to see Post 132, beneath some trees on the far side of a branch of the racecourse. Now go past Post 131 to the end of the brick wall and get down on to the driveway, and then turn right to pass some iron gates to arrive in front of the post. From this point you can, if you wish, make detours to visit posts 132 and 130, returning to this point. 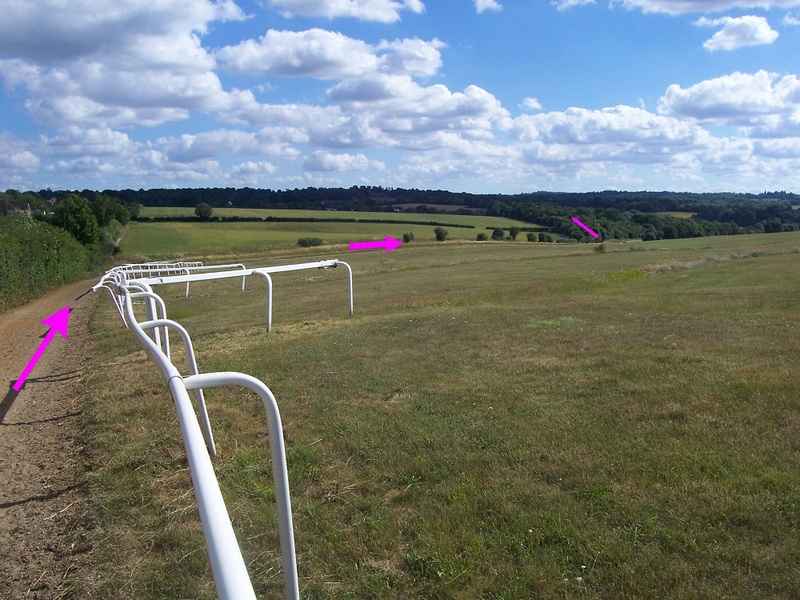 For Post 132, turn right along the main road and walk along it across a branch of the racecourse. For Post 130, cross the road and turn left along the racecourse fence until you find a pedestrian way across the course. Walk away from Post 131 and turn left along the pavement of the main road, Epsom Lane North. You will soon see Post 133 on the left ahead. Cross over a side road, Oaks Way, to reach the post, outside house No 100. Almost opposite there is a gap in the hedge on the other side of the road. Cross the road with care and go through this gap to join a bridlepath on the other side. Turn left and follow the path downhill, at first parallel with the road and then curving to the right beside a field behind a hedge on the left. 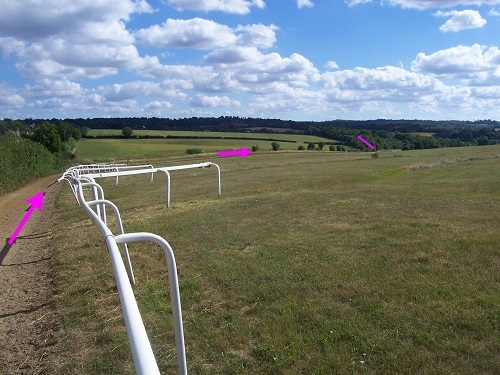 Ignore tracks branching off to the right into the open area used for training racehorses. Just past the end of the field turn left along a path which rises gently through a wooded area with fields sometimes visible on the left. When the path starts descending another path, waymarked with a big dark blue arrow, goes off to the right. 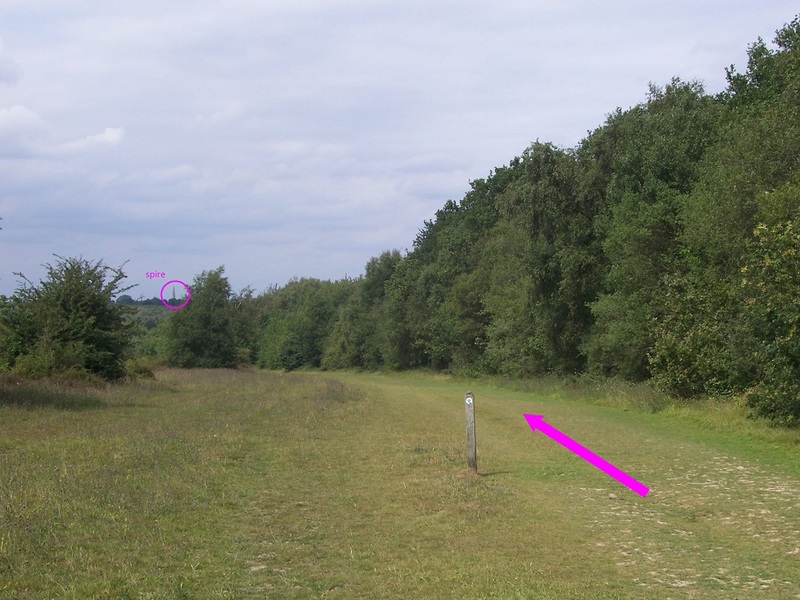 The next post, Post 134, is in the opposite direction, at the edge of wood to the left. It is not easy to locate, but if you find your way to the edge of wood it is at the highest point of the field just inside the wood. It may be difficult to believe now, but at one time there was a track leading here and the post was next to a gate into the field. Make your way back to the path and continue as it descends more steeply. You pass a number of side paths on the left and right and at the bottom there is one on the left leading to Downs Way Close. Ignore these and carry on ahead upwards along an enclosed path with houses to the left and open fields to the right. After a kilometre or so you come out on Motts Hill Lane. Your way lies to the right, but first make a short detour to the left to see the next post, Post 135. This is immediately behind a garden fence not far along on the right hand side of the road. Look for the point at which the fence changes from open palings to a taller solid panel type with a yellow fire hydrant sign in front of it. You can see Post 135 if you look to the left behind the first fencing panel. Then retrace your steps to where you joined the lane and follow it round to the left. For a shorter walk (about 2 km less), start from Tadworth station, the stop before Tattenham Corner on the branch line. From the station platform go up the steps or the ramp and turn right along The Avenue. (This is assuming that you are arriving from the London direction. If you arrive from Tattenham Corner leave the platform by the ramp, turn right to cross the railway and right again into The Avenue.) Follow the road as it bends to the left to the right of St John the Evangelist church. Carry on straight ahead for a while until The Avenue meets Downs Way and then turn left. Soon turn right into Motts Hill Lane. Where the lower height panel fence on your left ends, stop and look back behind it. Here you will see Post 135. Then carry on along the lane, following it as it bends round to the left. Shortly the lane turns right, but you should branch off along an enclosed footpath ahead between the entrances to houses called White Cottage and Derry. You will soon arrive at a junction of paths, where you will find Post 136. Pass the post and follow the track ahead, past the Bell pub and some houses, until you come to the Mere Pond at Walton on the Hill. You will see Post 137 ahead, so cross Walton Street and continue ahead along Deans Lane passing the post on your right, on the corner of Deans Close. Before the close was built the post was located nearer to Walton Street. Continue along Deans Lane past the Blue Ball pub; just before the lane starts to curve round to the right look out for Post 138 behind a wall in the garden of the house on the corner. It is easy to miss because only the top is visible but the wall has been specially constructed so as to leave the City shield visible. Continue along Deans Lane and take the first turning on the left, Chucks Lane. Where the lane turns sharp right by a white-painted house called Amberdene, continue on the footpath ahead into the woods. Immediately on your left, not far from the path, is Post 139. Continue on the path until very soon you meet a track crossing it, where you should turn right. When you arrive at a main road, Dorking Road, you will see Post 140 on the other side to your right. Cross the road and continue along the bridlepath. For some while now you will find yourself walking between woods on the left and Walton Heath golf course on the right. After short way you will find the next post, Post 141, on the left of the path and, after a similar distance again, Post 142 in a clearing at a junction of paths. Post 143 is a bit further still, on your left beside the path at the edge of the woods towards the summit of the hill. Continue forward and soon the wood on the left gives way to more open heath. Fork right to keep beside the golf course and after not much longer Post 144 comes into view on the left. Shortly afterwards Post 144a is on the right of the path. Ahead there is further woodland and you should fork right so as to keep this woodland on your left. Almost immediately Post 145 can be seen on the edge of the golf course to the right. 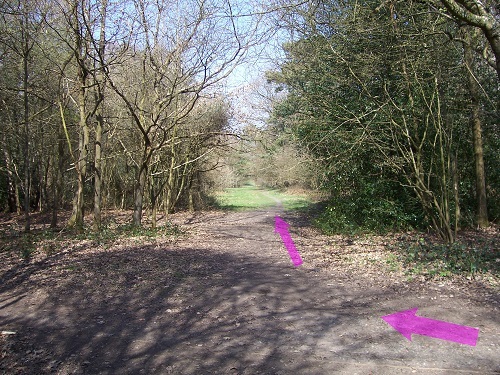 Continue along the path, now wooded on both sides, until, just before a major path junction, Post 146 can be found on the left. From here you can see the next post, Post 147, ahead on the right of the path. Soon afterwards you will come across Post 148 in middle of the path. Continue along the path, following it to the left when you reach the M25 motorway (which you will have heard for some time now). On reaching a road, turn right to cross the motorway and then, where the second side road branches off to the right, Post 149 is beside the road on the left. Continuing along the road Post 150 is very soon on the left and then Post 151 is straight ahead where the road ends at the gates to some houses. This is the most southerly of all the posts and one of the furthest from central London. Now retrace your steps a few metres and turn right along the path signposted North Downs Way. It is not long before you find Post 152 on the left hand side of the path, the last of the four posts situated south of the M25. At this point it is possible to take a short cut (saving about 1 km) by returning to where you left the road (or to make the walk even shorter by branching off to the right before reaching the road) and turning right to follow the road back over the motorway and then continuing along it until the road junction mentioned below where Post 153 is located. However, a more interesting walk continues ahead along the North Downs Way until you reach Colley Hill (a National Trust property), where you can leave the path for the open downland to rest and admire the splendid views from the scarp of the North Downs over the Surrey greensand hills and the Weald to the South Downs. You may also see planes taking off and landing at Gatwick Airport in the middle distance. 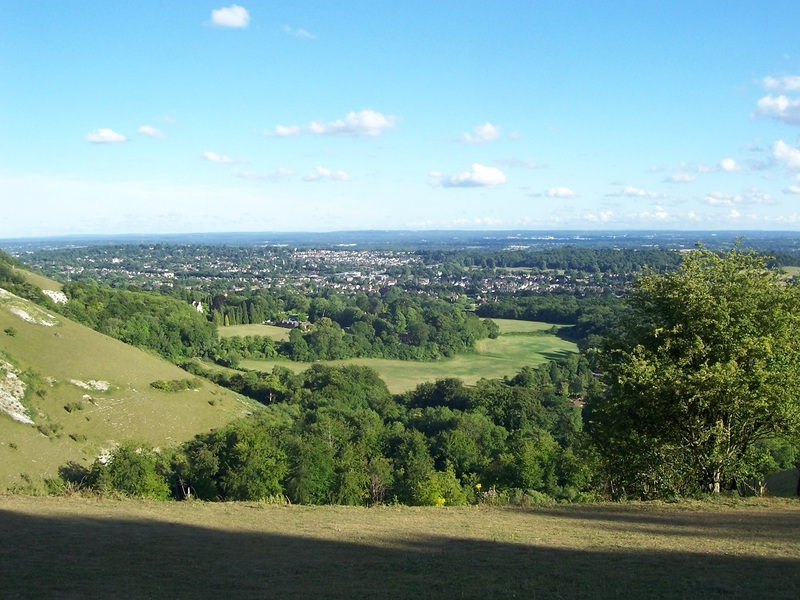 You could then return to Post 152 and take the short cut described above but a better route is to regain the North Downs Way at the back of the open downland and look for the prominent brick water tower festooned with radio aerials on the brow of the hill. Take the path which goes through a gate (with a North Downs Ridge Circular Walk waymark) to the left of the water tower. Follow this path over a footbridge across the motorway and through Margery Wood until you reach a small car park. At the junction of roads and paths by its entrance take the left-hand track (signposted Public Bridleway) closest to the car park and follow it, with the wood on your left and fields on your right. Cross over the first road you come to and turn right at the next one, which leads to a road junction where Post 153 is located. Whichever way you reached this post, take the road on its left, following the sign to the Sportsman pub. Continue past the pub to the end of road and follow a bridlepath across the heath for a couple of kilometres, ignoring forks to the left so as to stay close to the woodland on the right. When you reach a junction of bridlepaths, carry on ahead (signposted Public Footpath Hogden Bottom) to rejoin the edge of the woodland, with the spire of Kingswood Church just visible over the trees ahead. After this stretch of woodland you will find yourself walking beside the Leylandii hedge of a house on the right. After the hedge ends the land is more open, the path becomes stonier and the downward gradient increases. When you reach a track in Hogden Bottom, turn right and just before a barrier Post 154 is to be found on your right. Now go back a little, passing to the right of the notice board. Almost immediately you come to a junction of public bridleways: take the stony path uphill on the right. After the slope has eased you come to a path junction in a small clearing. To see Post 155 you need to make a detour, afterwards returning to this point. To do so, take the yellow-waymarked footpath forking off to the right. This path comes out on the Brighton Road opposite Warren Lodge Drive at a sign reading Public Footpath Mogador. The final slope down to the road is quite steep and you may want to continue on a path that brings you out on the road a little further on, from where you can get back to the footpath sign along the verge. From this point you can see Post 155 to your right on the other side of the road just to the left of a bus stop. You can, if you wish, cross over (with great care) and walk down the pavement to look at it more closely. Whether you do so or not, retrace your steps to return to the path junction where you left the bridlepath and turn sharp right to follow it onwards. Stay on the bridlepath, roughly parallel to the Brighton Road, ignoring forks to the left and right. When you come to Mill Road, cross over and continue ahead. When the path veers to the left you will be walking along a straight path with a cricket ground on the left and houses visible ahead. About half way along the cricket ground, turn right along a clear but unsignposted path in a broad clearing. When the clearing ends the path bends right and soon you pass a footpath signpost (your route is signposted Braggarts Pond) and reach the Brighton Road. Cross this busy dual carriageway and take the footpath opposite (signposted Public Footpath), which soon comes out on Bonsor Drive. Cross over and take the path opposite which runs beside fields and then a brick wall on the right. Soon after the wall gives way to a wooden panel fence you will arrive at a gate into the grounds of a large house, Red House. The final post of this walk, Post 156, is just to right of the gateway. Now, facing away from the house, take the track (a former drive to the house, signposted Public Footpath Brighton Road) leading half right ahead. This will bring you out on the main road again. Do not cross it, but turn right along the verge until shortly you come to a footpath sign on the right. Follow the path through a wood, through a kissing gate and across a field to another gate to the left of the buildings with dark grey slate roofs. A short enclosed path takes you to Waterhouse Lane. Turn right along the pavement, crossing over to the left when it changes sides. You soon come to the Kingswood Arms on the left where you can see Kingswood station ahead. At one time there were two posts (Post 156a and Post 156b) on either side of Waterhouse Lane about where the bridge over the railway is now. The railway was not built until after the abolition of the duties and the posts presumably disappeared during its construction. There are trains from here back to London (or, in the other direction, to Tadworth and Tattenham Corner).